Although co-written by David F. Walker and Sheena C. Howard, the first issue of Superb has all the earmarks of a great Walker comic: Down-to-Earth characters, an engrossing mystery and fun action. Things kick off with two seemingly disparate storylines. The main focus is on teenager Kayla Tate, a regular — i.e. non-superpowered — trying to straddle the line between jocks and nerds, and with an unhappy homelife. Meanwhile, there’s a larger story about illegal superheroes and one particular mysterious one on the loose. Eventually, these stories must connect, but not in this issue. The art by Ray-Anthony Height and Le Beau L. Underwood is gritty and street-wise, and very dynamic. 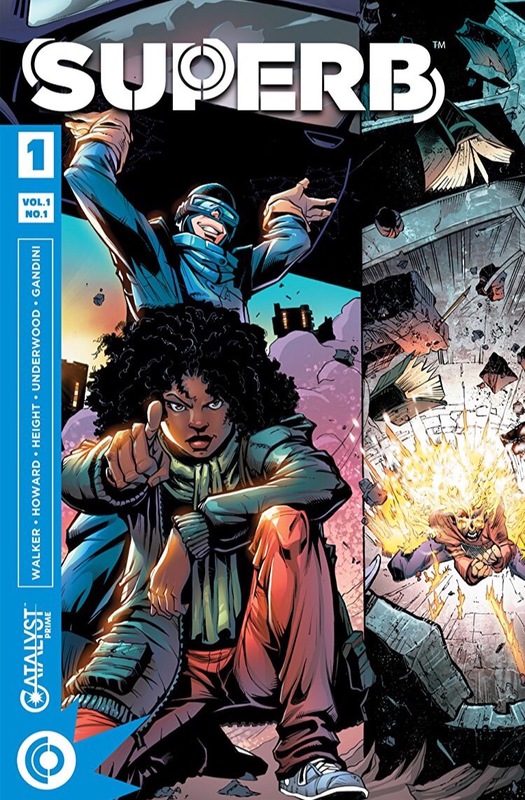 This is a superhero book with the heroes appearing at a minimum, but Height and Underwood make the actions of the “regular folk” dramatic and powerful. Who needs the heroes? We’ll see.